The iPad finally makes Mahjong accessible to all. Being a core gaming website naturally our editorial team has more than a passing interest in all types of games and not just mobile games.thus naturally once upon a time the old classic Mahjong came to our attention. 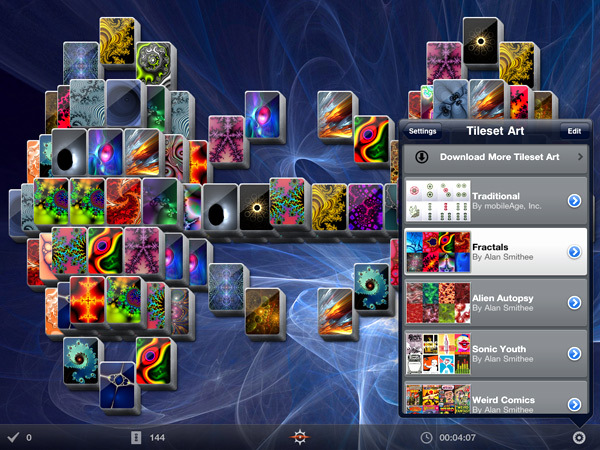 Our first and only computerised encounter with Mahjong was on a flash game a few years ago, unfortunately wanting a quick gaming fix and the Flash game not adequately explaining this revered Eastern game sufficiently, we soon lost interest and have missed out on years of the classic game because of it. Luckily then we came across Shanghai Mahjong which through it's wonderfully simple instructions has finally allowed us to start to enjoy one of the world's timeless games in the way it was meant to be enjoyed. 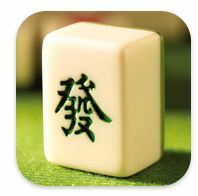 So thoroughly hooked on Mahjong at last it was up to LLC's app to keep us hooked.And it has in a big way! Now we are by no means experts at this addictive Chinese game so don't know all the ins and outs of it, but what we do understand of the app shows an enormous amount of attention and customisation lavished on this Mahjong App which will cost you the same pocket change that you would use to Buy Candy ! There are a variety of different rule and tile layouts to play around with first of all, then the In depth scoring is more than enough for a seasoned Mahjong player to keep on coming back to, and that's to not even mention Shanghai Mahjong's multitude of Game Center Achievements : " Wondering if you're king of the tile heap? Now you can see how you stack up against friends and other players world wide. From Morphious Moves to Slaying Dragons Shanghai's 33 built-in Game Achievements are guaranteed to test your zen-mettle in new and challenging ways." With very thematic names such as Ox Lunge , Dragon Tamer and T' ail Chi Master to the game center achievements there's certainly, when combined with the leader boards and universal scoring, enough to keep you coming back for more. Another feature that we've found particularly enjoyable is the ability to download new tile sets and boards for the Mahjong App. From classical and traditional tile sets to more obscure and arty tile offerings such as Alien Autopsy and Polish Cinema there's certainly enough Tile eye Candy to go about, appealing to our geeky side is the Fantasy tile set which we're currently using, the only downside being that we can't zoom in on the Mahjong tiles to admire the brilliant artwork that has gone into them. Another small gripe is that it would be nice to have some sort of soundtrack to play along to, a fussy gripe though as the app does allow you to play your own music in the background ( unfortunately the iPad we use for reviews is so chock a block full of apps that we don't have the room for music on it) Numerous accolades and positive reviews accompany Shanghai Mahjong and it's easy to see why, finally the obscure but brilliant game has been exposed to the world by a worthy Mahjong app. Mahjong is a popular recreation game that was originated from China. Today, it remains as one of the most popular games in Asia, especially in Japan, Singapore and Hong Kong.